My dinner today. I saw a picture of a similiar burger at Chiles on facebook. I was craving a burger forever. I feel like I’m in prison and I can’t go anywhere. I have been eating a lot of sandwiches and salads. Here is my break from it. My mom was kind enough to make it for me. 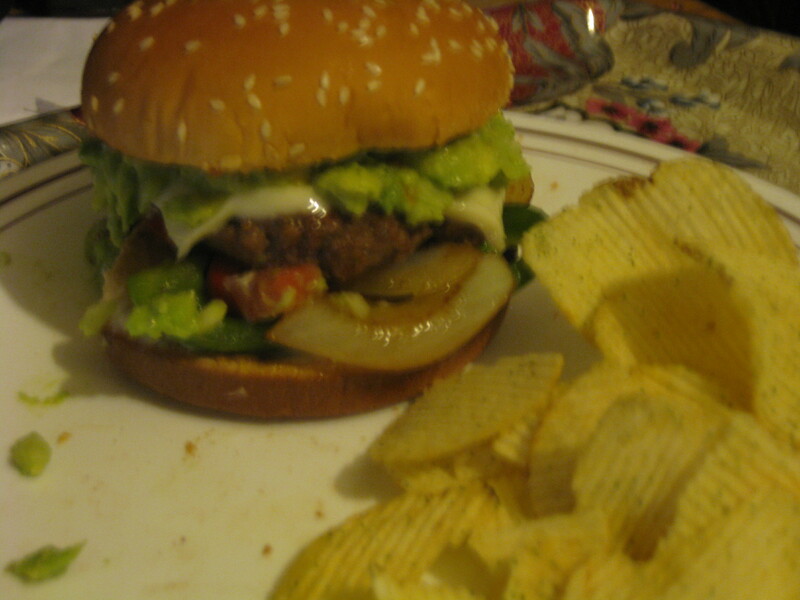 Guacomole, grilled onions and Bell peppers. Jack cheese as well. Nothing new today. My mobility is the same. Since I did so much on Mon and Tue, I’ve had to lay down a lot today because of it. Just feel more painful or sore. Its not horrible but its that day after working out feeling. I have to go to a training class on Friday for my new job and that is it. This entry was posted in Right PAO and tagged bilateral hip dysplasia, dysplasia, hip, hip dysplasia, hip surgery, hips, PAO, periacetabular osteotomy, recovery, surgery.